An exciting new Community Awards scheme has been launched. Cllr Julian Beale, Chairman of Cotswold District Council, is inviting the public to nominate residents and teams who are Cotswold Champions, helping to make the District a truly great place to live. The nomination process is very simple. Anyone recommending people or teams will be asked to supply the relevant contact details and also provide a statement outlining why their nomination deserves a particular award. The deadline for all entries (hard and soft copy) is noon on Friday 28 September. Update 28 August: No nominations have been received and so the election will need to be rerun with a new date. Following the resignation of Marc Buffery, a notice of election for one councillor has been issued. Anyone wishing to stand as a candidate at this election must complete and return a nomination paper by 4 pm on Thursday 23 August 2018. These are available to download below. If the election is contested, a poll will take place on Thursday 20 September 2018. 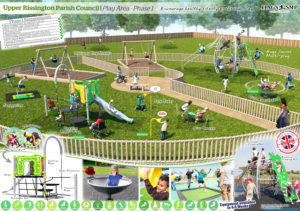 Back in June the Parish Council placed an order with HAGS for phase one of the play park renovation. The new equipment includes two new climbing frames – one for toddlers and one for school-age children – a spinning bowl, seesaw and trampoline. The project has been slightly delayed, for reasons beyond our control, but we are pleased that installation is now going ahead. Contractors will arrive on Tuesday 14 August to start clearing the site, and work will continue for about 3 weeks. Access to the play park will be from the nearest entrance, off Farman Crescent, and we would appreciate your cooperation in keeping the cul de sac clear of parked cars so that the play equipment installers can carry on with their work and there is no risk of damage to resident’s vehicles. The existing play park will be closed during the construction works. We’re sorry for the inconvenience, but think the end result will be worth waiting for! 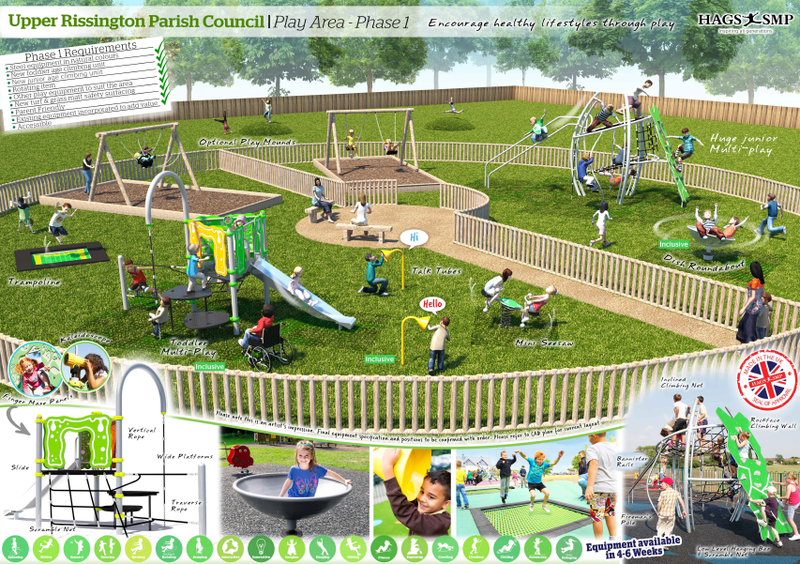 Click on the image for a larger view of how the play park will look when phase one is completed. If you have any questions or concerns about the installation, please contact the Clerk: clerk@upperrissington-pc.gov.uk. Cotswold District Council is currently undertaking a community governance review following a request made by Upper Rissington Parish Council earlier in the year. The review looks to increase the overall number of councillors on the Parish Council and, possibly, the introduction of parish wards. Letters and a consultation response form went out to all households in the Parish recently. If you have not received your copy of the letter, or would like another, then we have placed copies here on the website (below). The closing date for the comments is 20th September 2018.